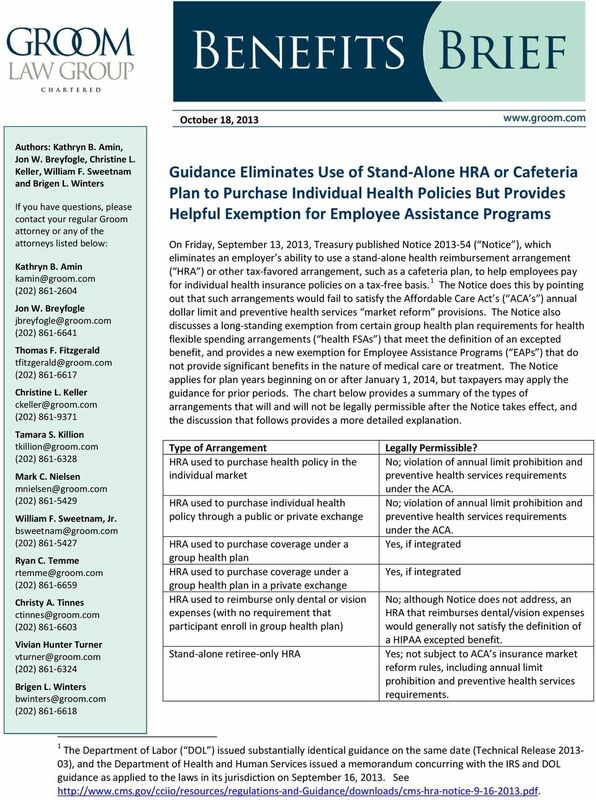 Download "HRA used to purchase health policy in the individual market. HRA used to purchase individual health policy through a public or private exchange"
3 prohibition against annual dollar limits on essential health benefits ( EHBs ) and the requirement to provide certain preventive health services without cost-share. Significantly, the Notice s application is not limited to HRAs. It creates a new term - an employer payment plan that will also not comply with the annual limit and preventive health services requirements unless it meets the rules in the Notice pertaining to participation in a group health plan. An employer payment plan appears to include any tax-advantaged arrangement to pay premiums. 2 Thus, a premium only plan, under which employees pay for a portion of health insurance premiums through a cafeteria plan on a pre-tax basis, would generally not be permitted to the extent employees are paying for individual health insurance premiums. Conversely, an employer payment plan does not include an employer-sponsored arrangement under which an employee may choose either cash or an after-tax amount to be applied toward health coverage. Thus, premium reimbursement arrangements made on an after-tax basis are still permitted. 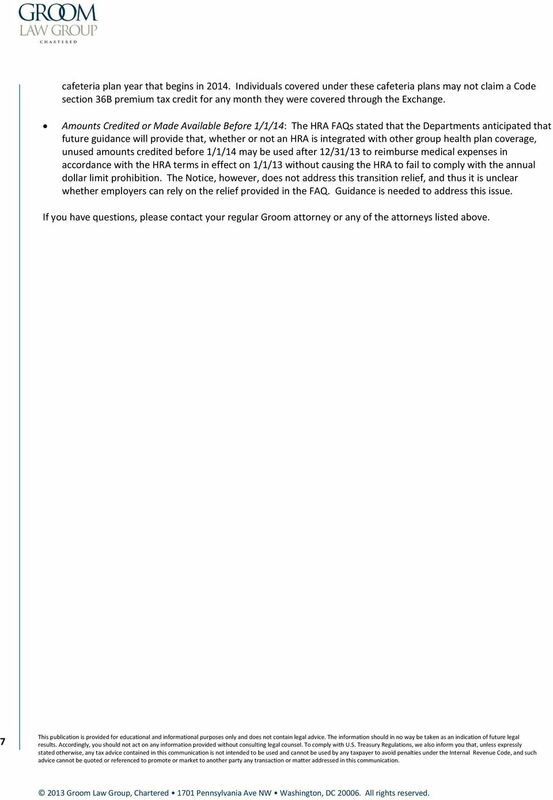 With respect to health FSAs, the Notice restates rules that must be satisfied in order for a health FSA to be considered an excepted benefit that is exempt from the requirements that generally apply to group health plans under HIPAA, including the market reform requirements under the ACA. With respect to EAPs, the Notice indicates that an EAP will be considered an excepted benefit as long as it does not provide significant benefits in the nature of medical care or treatment. Below is a summary of key takeaways from the new guidance. HRAs and Other Employer Payment Plans Prior to the Notice, the only formal guidance on the application of the annual dollar limit prohibition to HRAs was in the preamble to the annual and lifetime limits interim final regulations, which stated that an integrated HRA does not violate the prohibition against annual limits on essential health benefits, as long as the other coverage offered with the integrated HRA complies with the prohibition. 75 Fed. Reg (June 28, 2010). 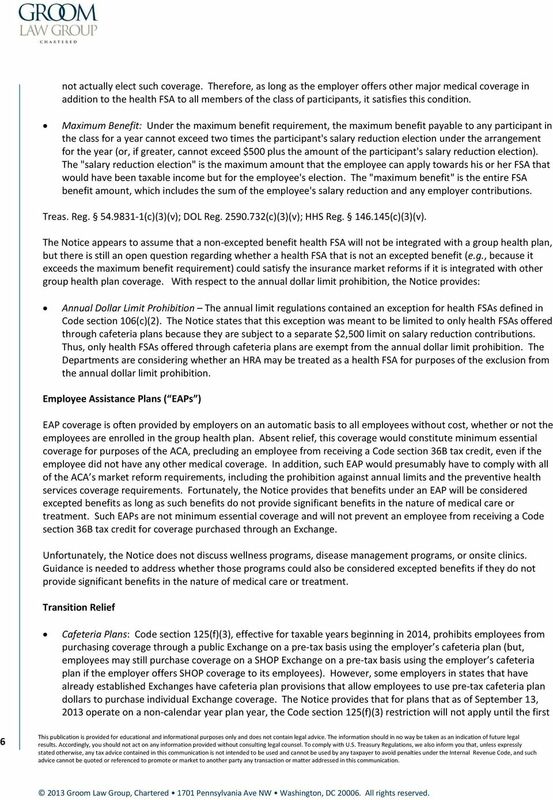 The interim final rule also clarified that retiree-only HRAs are exempt from the insurance market reforms. However, in FAQs issued on January 24, 2013 ( (HRA FAQs ), Treasury, DOL and HHS indicated that in no circumstances will an HRA be considered to be integrated with an individual policy. FAQs About Affordable Care Act Implementation, Part XI, FAQ- 2. Further, the HRA FAQs indicated that if an HRA participant is not also enrolled in the employer s major medical group health plan, such participant will not be considered to be enrolled in an integrated HRA. FAQs About Affordable Care Act Implementation, Part XI, FAQ- 3. Neither the preamble nor the HRA FAQs defined the requirements necessary for an HRA to be considered integrated. In addition, no prior guidance addressed the application of the preventive health services requirements to HRAs. 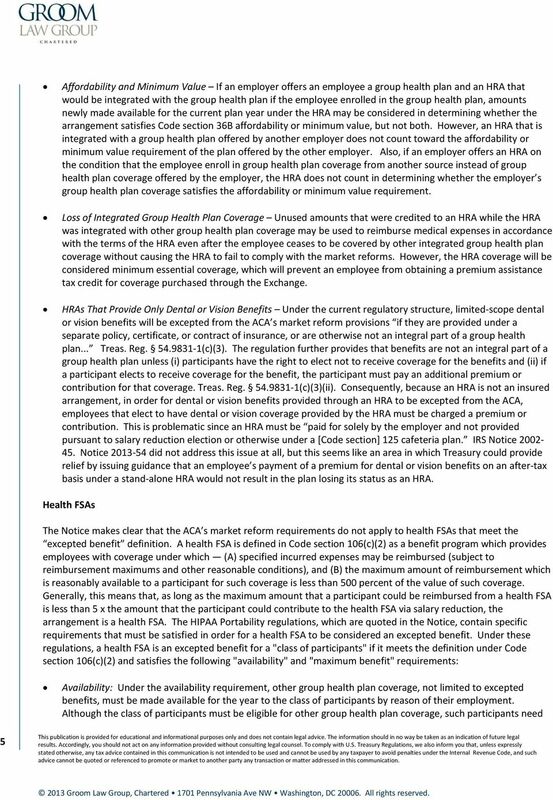 The Notice provides as follows: Individual Market Coverage An HRA or other employer payment plan used to purchase coverage on the individual market is not integrated with that individual market coverage for purposes of the annual dollar limit prohibition or the preventive health services requirements. In an example in the Notice, a group health plan that reimburses employees for an employee s substantiated individual insurance policy premiums would not comply with the annual dollar prohibition. 3 2 Some have argued that it should be possible to interpret the term employer payment plan more narrowly to exclude employee pre-tax salary reduction contributions paid through a cafeteria plan. However, because employee pre-tax salary reduction contributions are treated as employer contributions under the Internal Revenue Code, and because it appears that Treasury is generally trying to eliminate tax incentives for the purchase of individual health insurance policies by employees, it does not seem likely that the IRS intended this interpretation. HCR Bulletin. 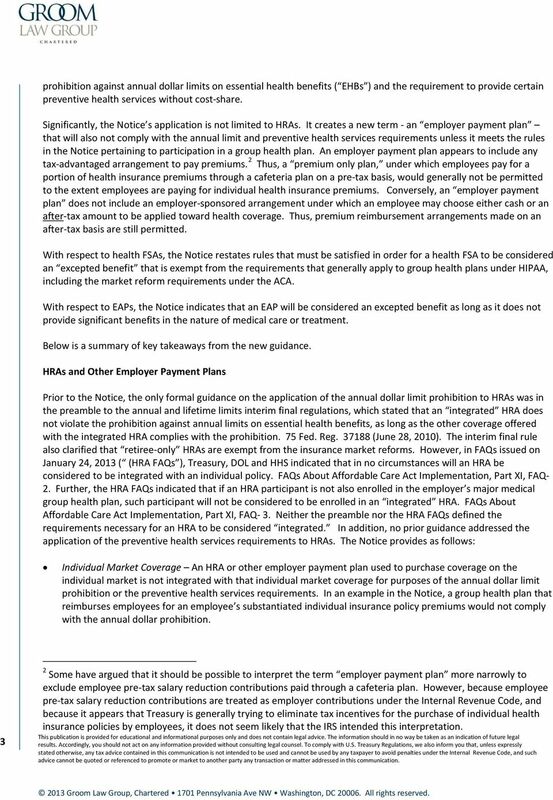 Guidance Issued on PPACA Market Reform Application to HRAs, FSAs, Individual Policy Premium Arrangements and EAPs. The following ECFA guide discusses some important aspects of the law and penalties that will be in effect on or before 06/30/2105. 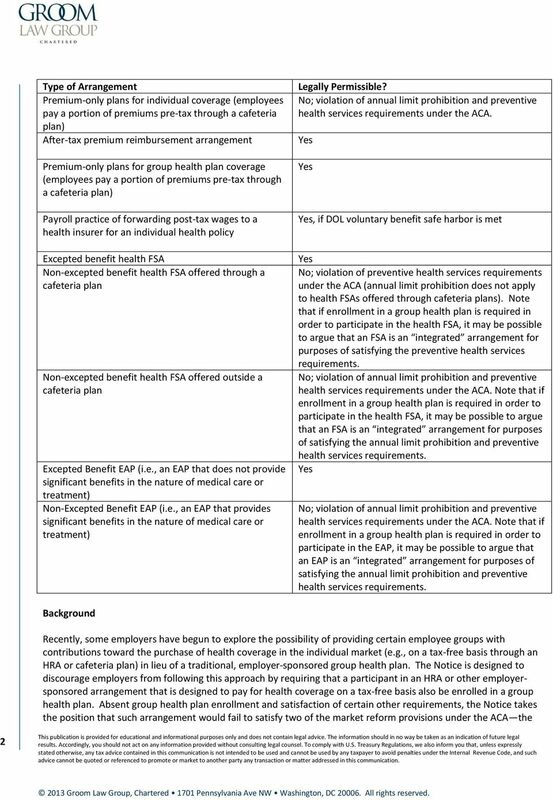 Health Care Reform Impacts Grandfathered Employer-Sponsored Group Health Plans: Now What? American employers need prompt action on these six significant challenges. We urge Congress and the administration to address them now. Eligibility. Sue Sieger, ACFCI, CAS. Senior Compliance Consultant Employee Benefits Corporation sue.sieger@ebcflex.com. IRS Issues New Proposed Cafeteria Plan Regulations On August 6, 2007, the Internal Revenue Service (IRS) published new proposed regulations on cafeteria plans ( proposed regulations for a copy visit http://edocket.access.gpo.gov/2007/pdf/e7-14827.pdf). 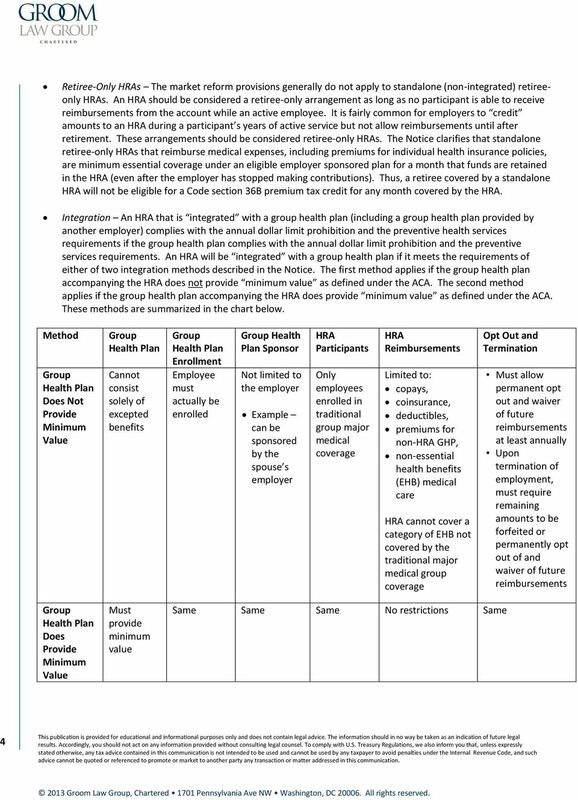 To help you understand the differences between FSAs, HRAs, and HSAs, please review the chart below. It will assist in deciding which account would complement the health plans your organization offers. Our Practice. Contact MARCH 2015. Author, Laura Westfall, New York +1 212 556 2263, lwestfall@kslaw.com. Kenneth A. Raskin. kraskin@kslaw. Laurus Strategies Legislative Brief: 2015 COMPLIANCE CHECKLIST The Affordable Care Act (ACA) has made a number of significant changes to group health plans since the law was enacted over four years ago.